Yesterday I started writing about Janice Hardy's excellent article, "What Downtown Abby Can Teach us About Tension," and her absurdly useful dissection of that shows structure. Today I'll pick up where I left off yesterday (How To Write Episodic/Serialized Fiction, Part 1 of 2) and take a look at the structure of the third and fourth episode. So far the storyline has concentrated on the main plot or arc. Call this the A plot or story. In the third episode we start focusing on the subplots. You can have as many subplots as you like, but you'll probably have at least two in a book-length story, or an extended serial. I'll call these the B and C plots. Janice Hardy reminds us that every character is going to be in conflict, in some way, with every other character. Even her allies! That is, the characters' goals will be exclusive, in some way, of every other character's goal: if one character gets what he/she wants then the other characters won't be able to. Each character--not just the main ones--wants something desperately, and has both strengths and weaknesses, quirks and contradictions, motivations and plans for action. Something is not only going to oppose each character's plans for action, but also oppose their will to act. I made up a long example to illustrate what I mean here, but, briefly, if John's plan is to kill Mark then two kinds of things are going to oppose his plan: internal drives and external obstacles. For instance, one thing that is preventing John from walking over and burying a mallet in Mark's head is that he'd go to jail (external obstacle). Of course, if John is very careful he might not get caught, but there's always a chance. After all, no one thinks they're going to get caught. Another thing that is preventing John from killing Mark is the inner certainty that it would be wrong and John wants to be a good person--or, failing that, at least not a very bad one (internal drive). In terms of the overall story these subplots add to the building tension. At every moment something is on the verge of going horribly wrong. Subplots inject variety and keep the main plot from going stale by creating other goals, other problems, other solutions, for the A plot to pick up on. Just as your characters are settling down into a routine--the first episode introduced the Central Problem, the second episode intensified the problem, the third episode explored the B and C stories, the subplots, and deepened our understanding of the Central Problem--now it's time to throw something new and unexpected, something different and out of control, into the mix. This new element will change things on a fundamental level. Just as we feel we have a good handle on the Central Problem, the Core Conflict, something happens to shake up the playing field. I think this works best when the change is something your characters couldn't possibly see coming. Perhaps this change involves a much bigger threat of a different kind. Why would we want to do this? Why would we want to change direction? Plots in the Abbey had played themselves out as far as they could, and forcing the issues would start feeling contrived. Add a war that changes everything, and sudden the petty problems become less vital, and the important problems become more so. When should we throw something big at our characters and change the nature of the Central Conflict? Sometimes things going wrong for the protagonist every single time starts to feel forced. You'd have to make your protagonist act like a total idiot for them to make a mistake or cause a problem. There's nothing you can do to make things worse or muck up the works, but you still need things to go wrong. An outside event could be the right answer to that. For example, have the main character need something from a secondary character, something that will create a problem for that secondary character since it opposes one or more of her goals. Also, we could do this the other way. What a secondary character needs from a main character could conflict with the main character's goal. Janice writes that mistakes and creative complications keep things unpredictable and reminds us that this is something we can take advantage of when we're escalating the stakes. Try having a couple of secondary characters who are selfish and mean-spirited. A couple of people who "don't care who they hurt to get what they want." Janice Hardy reminds us: People often don't want to do what's best for others, they want to do what's best for themselves. - "Don't have things happen without it mattering to someone." Excellent advice! Janice Hardy (@Janice_Hardy) also writes a column called Real Life Diagnostics where she pinpoints the problems in user submitted manuscripts. Great reading and valuable advice. I think it's worth noting that what I've presented here is just one way of structuring a serial and I offer it only as a potential starting point, perhaps like a grain of sand provides the starting point for a pearl. For instance Chris Fox, in his fabulously popular series Star Sailor, starts with a smaller Central Conflict and keeps building on that same conflict, making it bigger and escalating the stakes, until the end. Question: Have you ever written a serial? What structure did your stories have? 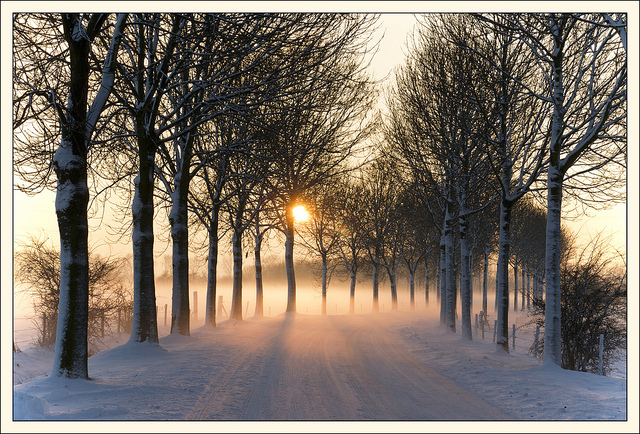 Photo credit: "Misty winter adfternoon" by Bert Kaufmann under Creative Commons Attribution 2.0.